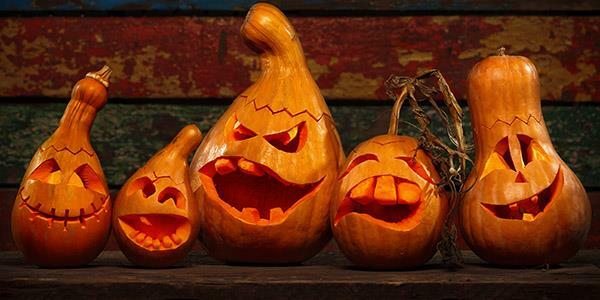 Perhaps one of the favourites during the autumn (with both young and old) is pumpkin carving. This season is squash season, they're all ripening in vegetable patches and appearing in the super markets, so it's easy enough to get your hands on one. Traditionally, superstitious people may have placed carved pumpkins and squashes, or 'Jack -o'-lanterns' as they were known, on their porches and doorsteps to ward of dark spirits, which is why they tend to be associated with Halloween. Don't waste the innards – there're so many autumnal recipes for pies and soups etc. that are really warming and full of delicious spices. Thanksgiving is a national holiday in the US, but celebrating it is becoming more and more popular in England. Thanksgiving is a day for giving thanks for the year's harvest and families and friends will gather for a big feast. 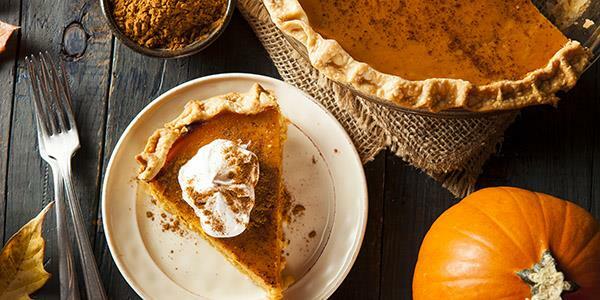 Common Thanksgiving foods include: turkey, cranberry sauce, sweet potato and for dessert: pecan pie or pumpkin pie. This autumn why not see what all the fuss is about and try out some simple recipes? 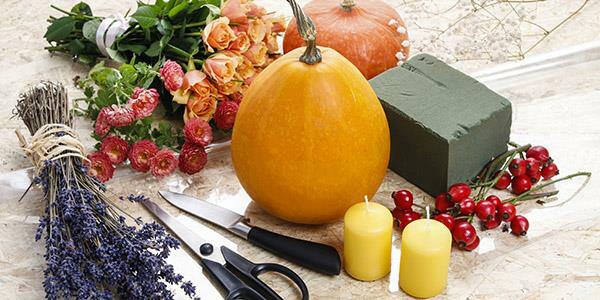 Making a centrepiece is a great way to get creative this autumn. Whether you have Thanksgiving in mind, or just fancy doing something a little different, a centrepiece can really give your table a lift. Traditionally the centrepiece sets the theme of the occasion, so at the moment the changing seasons, the harvest and the vibrant colours of autumn are a good place to start. Get the little ones involved and go foraging for bits and bobs: fir cones, conkers, red berries, nuts, fruit, oversized leaves, colours of warm golden-browns... whatever you can get your hands on. Start with a central base such as a vase or a bowl to give the centrepiece structure. If there are adults involved then using a tea light for the focus point can be a nice idea. It can be as simple as putting the tea light in a clean, clear jam jar and building out from there. Autumnal flowers such as dahlias and chrysanthemums often come in bright fiery colours; wheat is usually used in displays to represent the harvest. Red dogwood and bare branches can be used to pad-out a display just a foliage is used in spring displays. Nature Colour Walk: pick a colour or a shade and let the children search for as many examples of the same colour by romping all over and hunting high and low for berries, leaves, roots etc. Create a Nature Colour Palette. Go on a Scavenger Hunt: give them a list of bits and bobs to find and send them off. Mix things up a bit and vary how they have to present what they've found eg. 'Gather three conkers off the ground', 'Take a photo of yourself next to a frog', 'Find the biggest fallen leaf you can and stick it here'. Build a bug hotel or a hedgehog hideaway. Create your own obstacle course. Bring the autumn vibrance inside and enjoy having a little touch of nature decorating your home. This is one for all ages, everyone will love getting stuck in! Be as creative as possible and use any thing and everything that takes your fancy. Use things that you know are fair game (eg. from the ground or from your own garden). Seasonal gourds and squashes are great for adding colour, as are autumn flowers such as dahlias and chrysanthemums. 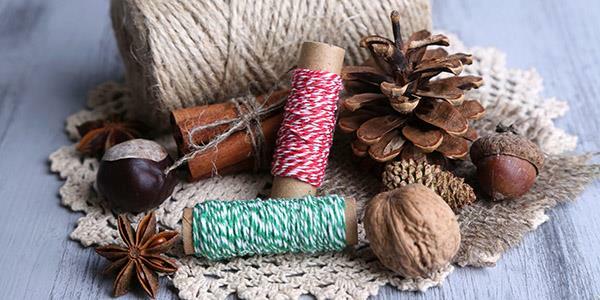 It could be as simple as filling a jar with pine cones or acorns and adding a candle, or some branches you've decorated. String decorations are a simple way to cover a large area. String together anything from leaves to dried orange slices to pinecones and hang them from the ceiling or around the room. You could weave small, plain fairy lights through a leaf hanging display, to give it more warmth. Create an autumn wreath for your door or porch. Decorate the outside of a jar and pop a tea light in it. If you just can't get your hands on enough leaves, get the children to draw and cut out leaf shapes from different coloured paper instead and hang that up. They could even use tissue paper for a more delicate display. Add some glitter! … Not too much, but just enough to add a dash of sparkle to the tips of your pinecones, or the lip of your jar, or the base of your acorn. Decorate cupcakes or cookies – they always look great as a table piece! 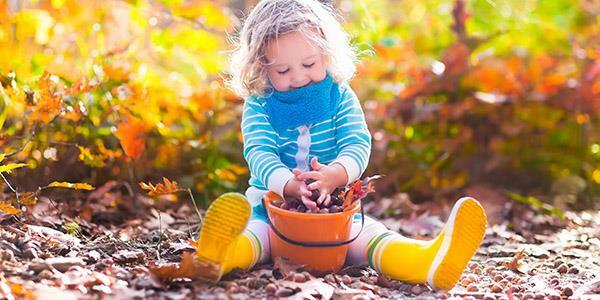 Enjoy a holiday filled with outdoor autumn fun. Take a look at availability with Lantern & Larks and get back to nature this season. Take a look at availability.